From November 21 to 23 in the final stage of celebrations for the 500th anniversary of the Catholic presence in Myanmar will be held. A reality that has taken 500 years, born and nurtured by missionary institutes. From the "sacrifices” in order to proclaim the Gospel gushed "seed" of faith. The prelate calls for a renewal, "according to the guidelines laid down by Pope Francis." Yangon (AsiaNews) - Burmese Catholics can make an enormous contribution to "nation building", working in the fields of education, in schools, in health care. Myanmar has lived "under a harsh military rule for half a century" and "all systems were destroyed," so "we need time, patience and resources" to rebuild the nation. This is according to Msgr. Charles Bo, Archbishop of Yangon, who in an interview with AsiaNews explains the Church's work in Burma, which is celebrating the 500th anniversary of its foundation. A Church that was born and which has grown thanks to the efforts of the missionaries to whom, says the prelate, "we are grateful for their example and service," for "the sacrifices they have made to proclaim the Gospel of salvation". After 500 years of history, how would you describe the situation of Church in Burma today? Today we are 16 dioceses, over 750 priests, 2500 Religious sisters and brothers and around 750,000 Catholics. Though Catholics only represent 1.3 % among 85% Buddhists, we are spread out among all the ethnic minorities and tribal areas. Through the Karuna ( Caritas) network the Church assists all people especially the poor in all areas, without discrimination of race or religion: in education, health programs and the world of work. Some forty years ago Thailand and Myanmar would have the same number of Catholics: around 350,000. To date Thailand has the same number and Myanmar has doubled. Can you describe the Church in Burma today in three words? Generous in sharing our resources; Devoted in our service for one another; Devout in our awareness of the Sacred. In your opinion, how much has the mission and works of Pime (Pontifical Institute for Foreign Missions) and other institutes contributed to planting and nourishing the seeds of faith in Myanmar? It was the tireless efforts of the Mission Societies that practically founded all the 16 dioceses in Myanmar. The Dioceses of Yangon, Mandalay, Pathein, Hakha, Kalay, Mawlamyine, Hpa-an, were fruits of the labor of MEP, French Missionaries. The Dioceses of Taunggyi, Taungoo, Loikaw, Keng Tung, Phe Khon, Lashio were the fruits of PIME Italian Fathers. The Dioceses of Myitkyina, Banmaw are the results of the works of Columban Irish Fathers. Pyay (Pyi) Diocese was run by La Salette, American Fathers. Along with the Missionaries, there were many Religious men and women who were responsible for the growth of the life of the Church as well as the Nation. To mention a few: the De La Salle Christian Brothers, Jesuits, Salesians of Don Bosco, Reparation Sisters, St. Joseph Sisters of Apparition, Good Shehperd Sisters, RNDM Our Lady of Missions, the local one like St. Francis Xavier Sisters and Brothers. Later on Missionary Sisters and Brothers of St. Paul's. Missionary of Faith, Little Way sisters and Priests, Zetaman sisters. Are missionaries still important for Church in Burma? Definitely. Missionaries are still essential to the work of the Church in Myanmar. Our resources are limited: We are in dire need of spiritual, intellectual and financial resources from international communities. Thus the network of religious could join hand in hand to work for the nation: in the educational fields, schools (formal and informal) and health areas. The Nation has been under the rule of a military junta for half a century and all systems have been destroyed. We a lot of time, patience and resources to re build society. 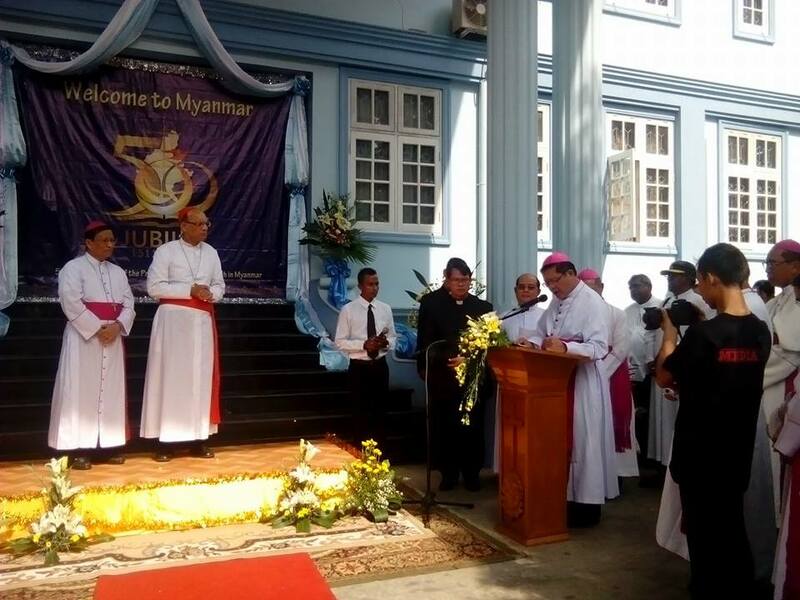 How, following Pope Francis' instructions, can the Burmese Church be more missionary? The Church in Myanmar has always been very traditional and many, including clergy, are a bit allergic to change. There is need for a change of mind-set and attitude in tune with Pope Francis. Often the Church is quite authoritative and centralized. There is need to empower the laity, the religious (especially religious sisters) and particularly women. They all should have a bigger and more active voice in decision making. Though the Church here is poor and for the poor, there is a greater need for the Church to offer special focus and outreach to the poor. The religious and clergy and bishops should get out of their comfort zones and go to their sheep, so - as Pope Francis says - they smell of sheep. The Church in Myanmar must engage more in inter-religious dialogue especially with different religious leaders: Buddhist, Muslim, Hindu and other Christian denominations. In this way we could promote peace and prosperity in the country. As we have suffered long standing prejudice and endless civil wars since Independence (1948) between the Military and different ethnic insurgents, we need to work hard for reconciliation. We must try to repair the past and work for justice. No justice no peace. No peace no development. How are Catholics participating in the celebrations promoted by Church? Was there much interest, involvement? More could be done as regards the animation at a national level. We have been preparing this whole year with prayers, Penentential Rites and Novenas in different dioceses. Then along with that the whole history of the 500-year-presence of the Catholic Church has been presented in all the dioceses. Of course the level of emphasis will differ from one diocese to another. Now the time is close at hand and many are eager to join in events in Yangon on November21, 22, 23. We expect around 100,000 to 150,000 Catholics. The Holy Father Francis has sent his Papal Envoy His Eminence Oswald Cardinal Gracias. Before the final Holy Mass the authorities, different Religious leaders: Buddhist, Muslim, Hindu and Christian will give the messages. Has wider Burmese society the majority of which is Buddhist, expressed any sentiments towards Catholics for the important anniversary? The Buddhists are very much in favor of our celebration. The Church throughout 500 years has been very close to the nation and to all the people. Living throughout very peacefully and cooperating all along. The final day of celebrations will be held in the National Stadium. It is the first time that the government has granted permission for such a religious celebration. The Papal Envoy will be given a State welcome and special launch and special security is being provided. Catholics are only 1% of Burmese society but what role can they play in Myanmar's path to reform, mostly in preparation for 2015 elections? We have the example of Jesus, or Martin Luther King, or Abraham Lincoln, or Pope Francis. This is not just a matter of one person, who could and can do such marvelous improvement and changes for humanity. I believe the Catholics though just 1% can do wonders. Firstly, by their example of love and unity and reconciliation among the people in the Nation. Secondly, by raising their voices and speaking out the truth. Many are already in Parliament. Thirdly, by being an example of people of integrity. Really sacrificing oneself for others. Finally, by sacrificing oneself in the pursuit of justice, human rights and dignity and caring for the lost, the least and the last. Your Grace, what is your personal message for Burmese Church and faithful on this special occasion? I personally proposed to the celebration of the 500th. Jubilee Celebration of the Presence of the Catholic Church in Myanmar. Historically in the year 1511 that the first groups of merchants arrived here in Myanmar with some chaplains. It was the starting point. We wish to tell the nation that Catholicism is not something that just recently arrived. It has already permeated the nation and we are part of the nation. Throughout these past 500 years we have the intention and proved already in our history and papers, how we were part of the nation building. Even educators in the Kings' palaces, as Cannon soldiers, even during the time of the colonization the mission schools were the main agents for the education of the students in the country. The Church was strong right through in health services, and capacity building. We existed 500 years ago, and someone would remark that the Baptists have been here just 200 years and the number of Baptists are more than double of the Catholic Church. Yes, it could be. My answer is that they counted not from the very point of the entry of one Baptist. Perhaps they started when the missionaries came in full force. Another reason is what I mentioned above. The Catholic Church emphasized on Nation building rather than proselytizing the people. We want to show our gratitude to all the Fore-fathers from the initial point. We are grateful for the service and example of our fore-bearers who sacrificed all that was possible to spread the Good News of salvation. We ask from the Lord, to fill us with zeal, to keep aflame in us the spirit of service and love of our missionaries. To heal those among us who are wounded, to give comfort to the afflicted, courage to the aged, mercy to those who are suffering. To continually bear witness to the Risen Lord.